Guest Post – "Stop the Insanity"
This past January like so many of you, I decided to take a fresh new look at my wellness. No, I did not join a gym or start some fad diet. I fired my doctor! This was not a revelation, but a revolution that also prompted me to make changes that will put me on the road to health. Being overweight is not new for me. I was a chubby kid, overweight teen and yo-yo’ed for much of my 20’s and 30’s. I had some successful weight losses. During my junior year of high school, I lost 70 pounds on one of those weight loss clinics that offer counseling as well as a food-based weight loss program. I did well. But over the next 4 years the weight came back. After college graduation, I lost weight again. This time through caloric reduction and intense exercise. I had a lot of free time then. Fast forward ten years, a demanding career with a crazy traveling schedule I am at the heaviest I have ever been. How did I get this way? Well, I am just starting to figure that out. In the ten years, I have been to a nutritionist, personal trainers, weight loss providers and of course my doctor. The nutritionist told me to “take a dinner plate and divide it into four parts – three of the four parts need to be vegetables”. Needless to my first visit was my last. The personal trainer, at 10 years younger and 200 pounds smaller than me, saw a big guy and worked me too hard, to the point where I ended up bed ridden with a herniated disk for 8 weeks. WeightWatchers, although helpful, sends mixed messages with counting calories instead of discussing quality and quantity of food. Besides the group counseling sessions are filled with mom’s struggling with their weight. That really doesn’t apply to my lifestyle. My doctor of 10 years told me to get weight loss surgery, and pushed it pretty hard. 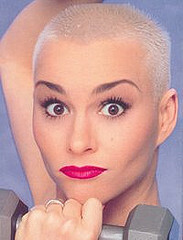 Through all this, I could not seem to get the mantra of that fitness and diet guru Susan Powter (you know the one from 1990’s with that white buzz cut) out of my head. Remember “Stop the Insanity”? Although maybe a little whacked out, she was kind of on to something. She mentioned that she too, went to the weight loss industry, the medical industry and the food industry all to help her lose weight. The problem is that none of them really want you to lose weight… or maybe better yet, they actually just don’t know how. Isn’t that amazing, they don’t know how. We have learned so many lies about food, our relationship with it, what is healthy and what is not, that even the experts do not know really how to keep us healthy. IF they don’t know, what are we supposed to do? Fire them all! And that is what I did! Thanks for your wonderful honest post FiredUp! I look forward to reading more from you!